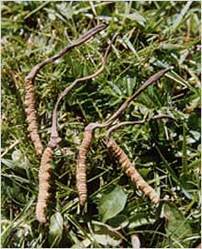 Common Name : Cordyceps Mushroom, Caterpillar Fungus, Chongcao, Deer Fungus Parasite, Dong Chong Xia Cao, Chong Cao. Habitat : Native to the himalayan mountains in india, tibet at an altitude ranging from 3000 to 5000 metre and in some provinces of china. Uses : It is used in various treatments including immunologic, antiarrythmic, hypoglycemic, antieoplastic and erythropoietic effects. It is used to strengthen the body after exhaustion or long-term illness and for impotence, neurasthenia, backache cough, anemia, tuberculosis, lower back pain, infertility, irregular menstruation, night sweats and senile weakness. It has been used as an aid in organ transplant surgery and for the treatment of viral hepatitis and lupus. It is also helpful in reducing high cholesterol and improving male function. It fights against stress, control blood sugar levels, lower blood pressure, reduce cancer risk and help the kidney against damage caused by the drugs cyclosporin and gentamycin. It has anti-ageing and anti-oxidant properties. Also used in the treatment of fatigue and weakness.